The 2011 movie was one of the best surprises of the year and a huge success at the box office. “Muppets Most Wanted”, while not as good as its predecessor, is still fun to watch. It reunites the team that made the first one so successful (without Jason Segel though and that’s a shame), including director James Bobin, and opens with a song called “We’re doing a sequel”. Nice try, but too much self awareness can ruin a picture, especially with characters that we love and admire. The plot this time around involves a ruthless agent (Ricky Gervais), who plans to have Kermit sent to the Gulag, while his evil Russian double replaces him on tour. From this point on, there is sufficient story, songs and gags to fill out an hour long TV special. 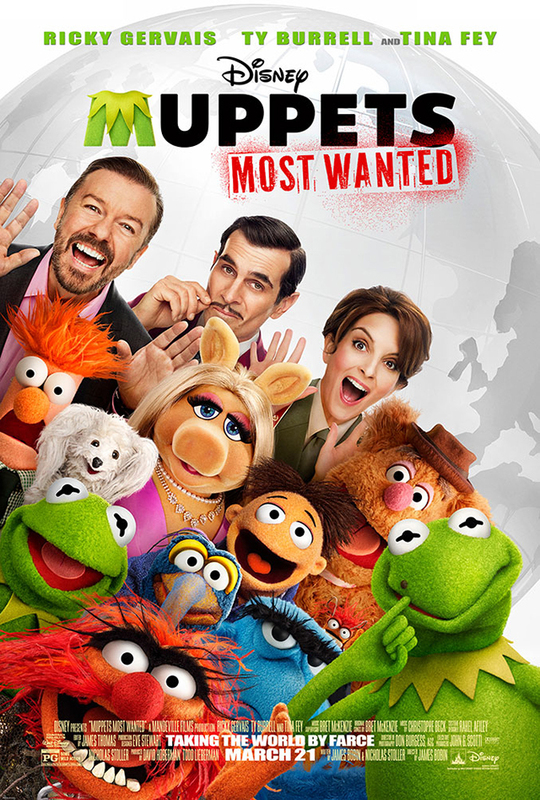 Unfortunately, “Muppets Most Wanted” runs 108 minutes, and at some point you can feel the life draining from it. Is the movie still entertaining? Damn straight. It’s always a pleasure to see Kermit, Fozzie, Miss Piggy and the rest of the gang back onscreen. But truth be told, they deserve a better movie. And so do we.